CVGHM reported that, since the Alert Level was raised on 12 February, seismic activity at Galunggung had drastically decreased through 27 May. During 27 April-27 May plants around the crater area looked green and lush, small fish were swimming in the water, and insects around the crater were active. Based on seismic data, crater lake water temperature and pH data, and visual observations, CVGHM lowered the Alert Level from 2 to 1 (on a scale of 1-4) on 28 May. This report mentions a possible ash plume from Galunggung volcano in July 2008 and various other anomalies, including discolored crater lake water during parts of 2011 and 2012. Our last report on Galunggung was in 1984 (SEAN 09:02), following a deadly eruption that began in mid-1982 and ended in early 1983. The following background information on the volcano was provided in 13 February and 28 May 2012 reports from the Indonesian Center of Volcanology and Geological Hazard Mitigation (CVGHM). 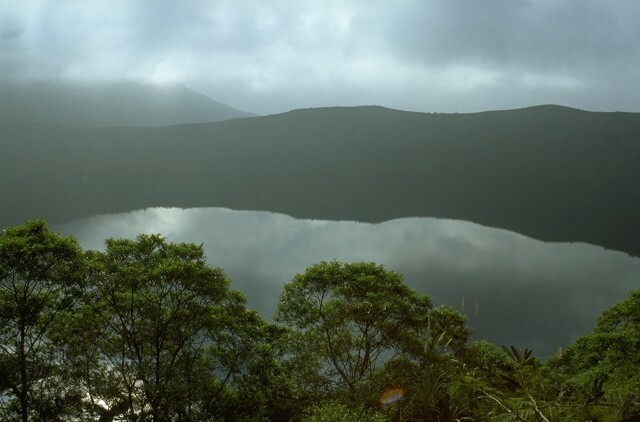 According to the latest report from CVGHM, the present-day lake in the conical crater of Galunggung volcano has a diameter of 1 km and a typical depth of 11 m. In the middle of the lake sits a small, 30 m high, 250 x 165 m scoria cone which was produced during the final stage of the 1982-83 eruption. Galunggung's hazards include phreatic and phreatomagmatic eruptions capable of draining the lake and producing mud flows. As further background, some of the historical eruptions were explosive, centered at the volcano's crater lake. These eruptions occurred four times, in 1822, 1894, 1918, and 1982-1983. The eruption of 1982-1983 occurred over a period of 21 months, from 5 April 1982-8 January 1984 (SEAN 07:04, 07:06, 07:07, 07:08, 07:09, 07:10, 07:11, and 07:12). In late June 1982, a British Airways jumbo jet encountered an ash cloud that stalled all four of its engines and abraded its windshield and wing surfaces. The aircraft lost 7.5 km of altitude before the engines could be restarted, but it landed safely in Jakarta (SEAN 07:06). Incorrect report of 2002 eruption; questionable one in 2008. Based on erroneous information from a pilot report, the Darwin Volcanic Ash Advisory Centre (VAAC) stated that an eruption occurred at Galunggung at 1748 hr on 23 August 2002. It produced a W-drifting low-level plume. No ash was visible on satellite imagery. Subsequently, Dali Ahmad of CVGHM had advised Dan Shackelford (amateur volcanist, now deceased) that the report of an eruption on 23 August 2002 was incorrect. It turned out that the likely cause of the incident was a bushfire near the volcano that led observers to believe that an eruption was occurring. Based on a pilot report and inconclusive observations of satellite imagery, the Darwin VAAC reported that on 17 July 2008 a possible ash plume from Galunggung rose to an altitude of 5.5 km and drifted SW. However, CVGHM did not report eruptive activity and advised that the volcanic activity status was "normal" at that time. 2011-2012 observations. CVGHM reported that from September 2011 to 8 February 2012 the crater lake water at Galunggung was discolored. In addition, a sudden increase in water temperature was measured, from 27° C on 5 February to 40° C on 8 February. Based on seismic data and crater lake observations, CVGHM raised the Alert Level from 1 to 2 (on a scale of 1-4) on 12 February and recommended that people stay at least 500 m away from the lake shore. CVGHM reported that after the Alert Level was raised, seismic activity at Galunggung decreased drastically through 27 May 2012. Moreover, on 27 April, plants around the crater area looked green and lush, small fish were swimming in the water, and insects around the crater were active. Based on seismic data, crater lake water temperature and pH data, and visual observations, CVGHM lowered the Alert Level from 2 to 1 on 28 May 2012. MODVOLC satellite thermal alerts were absent at Galunggung during 2011-2012 (and at least since 2000). CVCHM noted in its 28 May 2012 report that throughout the first half of 2012 Galunggung volcano was often covered in mist. Information Contacts: Center of Volcanology and Geological Hazard Mitigation (CVGHM) (URL: http://www.vsi.esdm.go.id); Darwin Volcanic Ash Advisory Centre (VAAC) (URL: http://www.noaa.gov/VAAC/OTH/AU/messages.html). 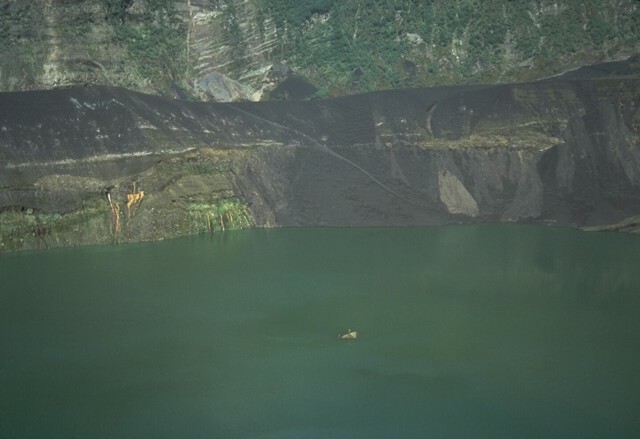 On 13 February, CVGHM reported that from September 2011 to 8 February 2012 discolorations in the crater lake water at Galunggung were observed. In addition, a sudden increase in water temperature was measured, from 27 degrees Celsius on 5 February to 40 degrees on 8 February. Based on seismic data and crater lake observations, CVGHM raised the Alert Level from 1 to 2 (on a scale of 1-4) on 12 February and recommended staying at least 500 m away from the lake shore. Based on a pilot report and inconclusive observations of satellite imagery, the Darwin VAAC reported that on 17 July a possible ash plume from Galunggung rose to an altitude of 5.5 km (18,000 ft) a.s.l. and drifted SW. CVGHM did not report eruptive activity and advised that the activity status was "normal." Reports that an eruption occurred at Galunggung on 23 August were incorrect. A brushfire near the volcano led observers to believe that an eruption was occurring. 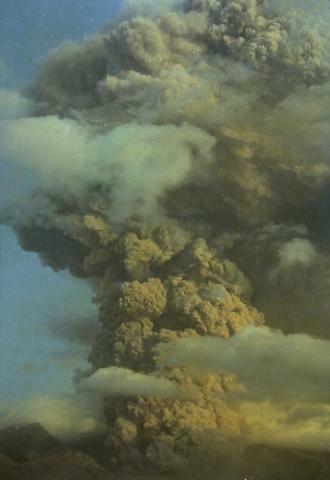 Based on information from a pilot report, the Darwin VAAC stated that an eruption at Galunggung on 23 August at 1748 produced a W-drifting low-level plume. No ash was visible on satellite imagery. A brief explosive eruption began before dawn 5 April, ejecting incandescent tephra and "stones as big as a human head" according to press reports. An image returned at 0700 by the Japanese geostationary weather satellite showed an eruption column about 50 km in diameter. The next available image, at 1410, showed that feeding of the eruption column had stopped and the plume had drifted about 250 km to the N. As much as 25 cm of ash fell on the flanks and ashfalls were reported from as far away as Garut, 35 km to the NW. The activity was accompanied by strong felt seismicity, and felt events continued in midafternoon. Two persons were killed and as many as 31,000 were evacuated, but most of the evacuees returned home within a few hours. A second explosive eruption occurred during the night of 8-9 April, associated with at least one felt earthquake. Hot mud flowed at 60 km/hour as far as 11 km down the SE flank, buried houses in at least six villages, and destroyed a bridge over the Cikunir River, which emerges from a large breach in the SE side of the crater (figure 1). Officials said that only about half of the 8.6 x 106 m3 of material in the crater had been ejected and feared that the steady rain falling on the area could trigger more mudflows. AFP reported eight persons dead, three missing, and 22 injured. UPI reported that many were burned or suffering from the effects of toxic volcanic gases. Authorities have forbidden entry into several areas where gases were seeping from cracks in the ground. The rice crop, within a month of its harvest, was destroyed. Figure 1. Sketch map of Galunggung crater and vicinity, showing the Gaunug Jadi lava dome, Walirang ridge, major drainages, and flank towns. A temporary volcano observatory was established in Cikasasah, 7 km SE of the crater. From Katili and Sudradjat, 1984. Information Contacts: D. Haller, NOAA; C. Dan Miller, USGS; Jakarta DRS; AFP; UPI. After 64 years of quiescence, a series of explosions . . . began 5 April. The most recent of these, which are reported to have claimed 30 lives, occurred the night of 17 May and at 1600 on 18 May. There is no permanent observatory at the volcano, but seismic monitoring has been conducted there for three months of every year since 1976. No significant seismic activity was recorded during the last monitoring period, September-November 1981. Residents of villages 3 km from the summit felt an earthquake about 2200 on 4 April. At midnight, subsurface rumbling was heard, followed by emission of thick white fume. Detonations began at about 0200 on 5 April, and at 0400 a larger explosion ejected a black cloud. Explosive activity continued until about 1600, depositing ash on Bandung (population more than 1 million), 65 km to the NW. Persons living near the volcano fled the activity. The next day, VSI recommended to local officials that the SE flank remain evacuated within 6 km of the summit, but other residents could return to their homes. An explosion at 2108 on 8 April, 23 minutes after a M 3.8 felt earthquake, was described by VSI on 1 May as the main eruption of the series. No local earthquakes had been reported since 6 April. A pyroclastic flow traveled 5 km from the crater down a SE flank river valley (the Cibanjaran), destroying small villages in the evacuated zone. Large volcanic ejecta killed three people 7 km from the volcano and ash fell as far as 23 km away. After this explosion, both eruptive and seismic activity ceased for several days. Earthquakes resumed 11 April. The number of events varied, but magnitudes and total energy release increased. Based on the seismicity, residents were warned 20 April of the danger of more eruptions. Local newspapers reported moderate explosions 20 April. A thick black and white cloud ejected at 0808 rose ~ 2 km. Louder explosions at 0815 were followed by the ejection of a dense black cloud. Ash fell on nearby villages. At 0850 explosions were occurring every 15 seconds. By late afternoon six explosive episodes had been detected from nearby villages and rain mixed with ash was falling. Small eruption columns were observed 21-22 April. In accordance with VSI recommendations construction of dams to protect inhabited areas from lahars had begun by mid-April. Renewed explosive activity began 25 April at 0455. A pyroclastic flow again moved down the Cibanjaran River valley, reaching 4.7 km from the crater. Tephra fell to the E and SE, with lapilli falling about 7 km away. As of 30 April, no additional eruptions had occurred, but VSI expected activity to resume within a few days. AFP reported that an explosion occurred 6 May at 0105. Ash fell 160 km away and two people were injured by hot tephra in Garut. On 17 May hot tephra showered the town of Tasikmalaya (17 km ESE) and injured four people; on the 18th, 2 cm of tephra accumulated there. Information Contacts: VSI; M. Krafft, Cernay; Jakarta DRS; Kompas and Sinar Harapan, Jakarta; AFP. Intermittent explosions began 5 April, destroying ~ 90% of Gunung Jadi, the lava dome extruded . . . in 1918. Lahars and nuées ardentes flowed SE through the breach onto the upper portion of the major prehistoric landslide deposit. The highest reported ash column reached 16.5 km, pitting the windshield of a passing airplane. Ash fell as far away as the Yogyakarta-Solo area, ~ 300 km to the E.
The ten eruptive episodes that had occurred as of late June were separated by quiescent periods that ranged from three days (early in the eruption) to three weeks (before the 24-27 June explosions). Nuées ardentes produced by the first five explosions (5, 8, 20-21, and 24 April, and 6 May) traveled a maximum of 5 km. After the 6th eruptive episode, on 13 May, ~ 90-95% of the 1918 lava dome was still intact, with destruction limited to weak zones on its NW and SE margins, but the next explosions, on 17-19 May, left only ~10% of the old dome in the crater. The 24-27 June explosions dropped 8-18 cm of ash and lapilli on villages 7-10 km W of the volcano, destroying hundreds of houses. Indonesian newspapers reported that people a few km from the crater heard thundering sounds and saw glow over the volcano before the explosions began. Residents of Tasikmalaya (17 km ESE of the volcano) saw incandescent tephra ejection at 1900, 1910, and 1930. At 2050, a British Airways jumbo jet with 240 persons on board, flying roughly 150 km WSW of Galunggung at ~11 km altitude, encountered an ash cloud that stalled all four of its engines and abraded its windshield and wing surfaces. St. Elmo's fire was noted in the cockpit as the jet flew through the ash cloud. The aircraft lost 7.5 km of altitude before the engines could be restarted, but it landed safely in Jakarta. Light ashfall began about midnight in Bandung, stopping by morning, but the city remained in semi-darkness into the afternoon. Images from the Japanese GMS and the NOAA 7 polar orbiter showed that the eruption cloud moved W then curved toward the S with its distal end reaching a point roughly 850 km S of Galunggung. A similar explosion occurred at about 1000 on 25 June. Five hours later, data from infrared satellite imagery showed that the top of the cloud produced by this explosion had a temperature of -65°C, corresponding to an altitude of ~13.5 km, well below the tropopause at 15.3 km (-76°C). Winds at 13.5 km were from the NNE, and satellite images showed that the cloud moved toward the SSW to roughly 900 km from the volcano, before dissipating by 1500 the next day. Chemical analyses show a consistent decline in SiO2 content, from 55.7 weight % in samples from the first explosion to 49.2% in the June tephra. A significant increase in MgO, FeO, and CaO content was also noted between early April and late June. The seismic record has shown continuous tremor (amplitude 2 mm at magnification 2,000x) and specific precursory signatures before explosions. According to a preliminary estimate of the VSI, magma was located about 3 km below the surface in late June. The VSI indicated that the interval from 27 June until the next explosive episode might last 1-3 weeks but that quiescent intervals may tend to increase in length. Three additional explosions were seen on satellite imagery 13-15 July. On a GMS image returned 13 July at 2300, a plume that appeared to be several hours old extended S from Galunggung, then curved SE. A Singapore Airlines jumbo jet carrying 230 passengers flew into this cloud at about 9 km altitude. Three of its four engines stalled, but after losing ~2.4 km of altitude, pilots restarted one engine and landed safely in Jakarta. Air traffic has now been rerouted away from Galunggung. A much smaller cloud emerged from the volcano shortly before 0700 the next day and moved SE. By 1900, the distal end of the first plume was about 850 km ESE of Galunggung and the second, narrower, plume extended nearly 600 km SE. A third explosion at about 1800 on 15 July appeared comparable in size to the first. By 2300, the cloud had moved ~ 500 km to the S.
A volcanic hazard map prepared in 1974 has been used successfully by volcanologists and civil authorities to delineate danger zones at Galunggung, including areas at risk from lahars produced by rainfall on recent ejecta. After the 24-27 June activity, the number of evacuees had climbed to 40,000, living in temporary government barracks. Of the 27 deaths associated with the eruption, only three have been caused directly by pyroclastic material. Information Contacts: A. Sudradjat, VSI; D. Haller, M. Matson, and J. Paquette, NOAA; W. Smith, FAA; M. Krafft, Cernay; Sinar Harapan, Jakarta. Intermittent eruptive activity continued to shower tephra on the area around the volcano and to send avalanches of pyroclastic material down river valleys draining SE. Beginning at 1940 on 13 July and culminating with a fatal eruption on 16 July, explosions sent ash and lapilli as far as 40 km, destroying homes and refugee facilities. The first explosion was heard up to 50 km away, and rumbling sounds continued during the episode. By 14 July at least 2 cm of ash had fallen in Tasikmalaya. The daytime sky was dark, the smell of sulfur noticeable. Explosions were heard as often as every 2 minutes, and the eruption column rose to 3-4 km. Six hot avalanches had traveled SE down the Cibanjaran and Cikunir Rivers, some as far as 2 km, by 15 July. At least 18 volcanic earthquakes had been recorded by the seismograph at Cikasasah, about 7 km SE of the volcano. When Galunggung erupted at 1500 on 16 July, at least 10 persons were killed, dozens injured, and many settlements destroyed. No information was available for 16-28 July. Eruption plumes extending S and W were noted on GMS images 28, 29, 30, and 31 July, and 1 August. Images between 2000, 28 July and 0400, 29 July, showed a plume extending 800-900 km SSW from the volcano. Cloud-top temperatures of -40 to -45°C indicated an altitude of 10-10.5 km. This high plume was accompanied by a smaller, lower plume extending W. A new plume that had traveled WSW was seen on the image at 2300, 29 July. Indonesian radio reported that the 29 July eruption began at 1930 with thunderous explosions that continued for at least 3 hours and resulted in scorched forest areas. Tephra fell in Garut. Satellite images recorded eruption plumes extending SW on 7, 9, 11, and 13 August. On 14 August a plume extended about 110 km S, then 110 km W. The Indonesian news agency Antara said the 9 August eruption began at 0935 with roars heard 50 km away and lasted over 3 hours. It produced "explosions of glowing magma," a 3-4-km-high eruption column, and tephra fall over a 40-km radius. According to Antara, seismographs registered slight tremors of 2 mm amplitude on 13 August, followed by larger shocks of 8-12 mm amplitude at 1124. The eruption began at 1215 with rumbling and explosions that sent tephra and vapor to 2 km. At 1230 another tremor was recorded, accompanied by rumbling and tephra fall through a slight drizzle as far as Garut, where residents likened the sky to gloomy twilight. The eruption lasted until 1455. Ash from the larger explosions has been reported as reaching Australia. Brilliant sunsets and twilight enhancement have been observed in Sydney. Galunggung's explosive eruptions have forced the evacuation of 62,000 persons from the densely populated area close to the volcano. The horseshoe-shaped crater opens SE. Glowing avalanches have traveled 5 km, and mudflows generated by heavy rains 10 km down main river valleys draining in that direction. Houses, rice fields, fish ponds, and roads have been destroyed. The government of Indonesia asked UNDRO to coordinate international assistance and to help evaluate the hazards and relief needs. Information Contacts: M. Matson, S. Arnette, R. Borneman, D. Haller, and J. Hawkins, NOAA; D. Anderson, Singapore Airlines; Kompas and Sinar Harapan, Jakarta; Jakarta DRS; Antara News Agency, Jakarta; AFP; UNDRO News (July 1982). Frequent periods of explosive activity continued through early September . . . . A GMS image on 16 August at 1000 showed a plume that extended S then curved W to about 8°S, 100°E. By the time of the next available image, five hours later, feeding of the plume had ended and only remnants remained, S of Java. After about ten days of quiescence, explosions resumed early 26 August. Antara radio reported that fire flashes were ejected from the crater for about six minutes starting at 0311, followed by roaring sounds that caused panic in Tasikmalaya. Around dawn, grayish ash rose 7-8 km above the summit and glowing material appeared to slide 200-500 m from the crater. "Flames" rose 50-100 m around the crater. Between 5 and 10 cm of ash fell in Garut. Ash darkened Bandung until 1030, reducing visibility to 3 m even in lighted areas. Residents of Jakarta (Indonesia's capital, about 170 km NW of Galunggung) remained indoors as ash thick enough to cover car windshields fell within a few minutes. GMS images indicated that ash ejection began about 0500 and lasted about two hours. Feeding had clearly stopped by 1000. A smaller explosion started just before midnight and appeared to be continuing on an image returned at 0100. On 30 August at 1015, Galunggung ejected a 5-6-km-high dense black and white eruption cloud followed by a series of thundering sounds and flashes. Heavy ashfall was reported near the volcano, and lighter ashfall occurred in Garut and in Bandung, where it began about 1300. Loud explosions accompanied by flashes of incandescence started again at 0353 on 31 August and continued until about 0930. Heavy tephra fall darkened villages a few km from the volcano and lapilli as large as marbles caused the collapse of two buildings. Satellite images showed a cloud, somewhat larger than many previously ejected by Galunggung, moving SSW. An explosion 2 September at 0400 was followed by a second, more powerful one at 0425. Heavy ashfalls disrupted traffic between Bandung and Cirebon (about 100 km from Bandung and 75 km NNE of the volcano) between 0900 and 1600. No additional explosions had been reported as of early September. Cloud top temperatures determined from NOAA 7 polar orbiter infrared images have been compared with radiosonde temperature/altitude profiles above 5.95°N, 116.05°E to yield approximate cloud top altitudes (table 1). Table 1. Galunggung cloud-top temperatures determined from NOAA 7 polar orbiting satellite images, 25 June-29 August 1982, with altitudes calculated from nearby radiosonde temperature/altitude profiles. Courtesy of Michael Matson, NOAA. Information Contacts: D. Haller, O. Karst, and M. Matson, NOAA; Antara News Agency, Jakarta; AFP; BBC. Occasional eruption clouds could be seen on satellite imagery in September. Explosive activity that probably began about 0000-0030 on 19 September, produced a moderate-sized plume that appeared on an image at 0100. Six hours later, the plume was considerably more diffuse and feeding had stopped. At 1900 on the 22nd, an image showed an eruption cloud beginning to emerge from the volcano. No other explosions have been reported through the end of September. Information Contacts: M. Matson, D. Haller, and J. Hawkins, NOAA. Occasional explosions continued through early November. On 14 October, emission of thick grayish clouds was accompanied by intermittent thunderous rumbling sounds. An explosion at 1145 ejected ash that fell on the area around the volcano. At 1300, a GMS image showed a small plume moving SE. By the next image, three hours later, the plume was dispersing. After roughly two weeks of quiet, strong earthquakes were felt and several flashes of light preceded an explosion during the night of 3-4 November that ejected a thick cloud. Ash again fell near the volcano. GMS images showed a moderate to small plume from activity that probably began about 1700 on 4 November. The plume, which drifted SSE, was visible on the 1900 image but had dissipated four hours later. Inspection of satellite data revealed no other explosions, but the rainy season has begun in Indonesia and weather clouds are making eruption plumes considerably more difficult to detect by satellite. Local authorities and villagers were building small dams near the volcano to prevent lahars from causing damage in river valleys during the rainy season. Information Contacts: D. Haller, E. Hooper, and A. Smith, NOAA; AFP; Kantor Berita Antara, Jakarta. Press sources reported that an explosion on 3 December ejected ash and incandescent material. Strong winds blew fine ash to Garut. Within an hour, lahars were flowing down two river valleys. Heavy clouds that cover Java for much of the day during the rainy season prevented satellite observation of the eruption cloud. No explosions had been reported since 4 November and the 3 December explosion was said to follow "a period of relative calm." Since the eruption began 5 April, ~ 40 x 106 m3 of tephra and mud have accumulated on the flanks of the volcano. Monsoon rains threaten to remobilize this material and form destructive lahars. In the primary danger zone, residents have been given 40,000 plastic bags, which are to be filled with sand and used as a protection against flooding. Authorities have warned residents of the city of Tasikmalaya of the danger of lahars. Information Contacts: D. Haller, NOAA; AFP; Sinar Harapan, Jakarta. VSI reported that tephra ejection continued through mid-Jan, but with consistently decreasing intensity. Three explosions were reported in November, two in December, and one in the first half of January. Ash columns rose to ~ 3-5 km in November and December and to about 2 km in January. Glows, frequently observed during the December and January explosions, lasted for several hours to several days. Indonesian air traffic control authorities reported explosive activity on 4 January at 1900 and issued an alert to aviation. Within the 1982-83 crater, a tephra cone ~200 m in diameter and 70-80 m high has developed in the area once occupied by the 1918 lava dome (Gunung Jadi). A 20-30-m-diameter vent in the new cone ejected pyroclastics to several tens of meters height. Strombolian activity occurred from this vent in January. The Department of Public Works has controlled lahars along the Cikunir, Cibanjaran, and Ciloseh rivers by constructing a series of dikes and pocket dams 5-7 km long, concentric and radial to the active crater. As of mid-Jan, the dikes had stopped lahars from reaching the city of Tasikmalaya, population 700,000. Press sources reported that on 9 October at 1111 Galunggung ejected a thick grayish cloud to 800 m height. At a VSI observation post on the flank, tremor amplitude reached a maximum of 45 mm. About 15 minutes later, a second explosion produced a 1 km-high cloud. The much larger explosion that followed generated a dense eruption column that reached a height of 8 km and was accompanied by lightning and thunderous sounds. At about 1610 a fourth explosion ejected sand-sized tephra that caused the collapse of 60 houses in a nearby village. Rainfall later that afternoon washed ash from house roofs in Tasikmalaya. The 3 December explosion began at 1730. The activity began with a thunderous sound and ejection of incandescent material from the crater. Tremor amplitude at the VSI observation post increased from 25 mm to 41 mm. By 1820 lahars were flowing down 2 rivers. 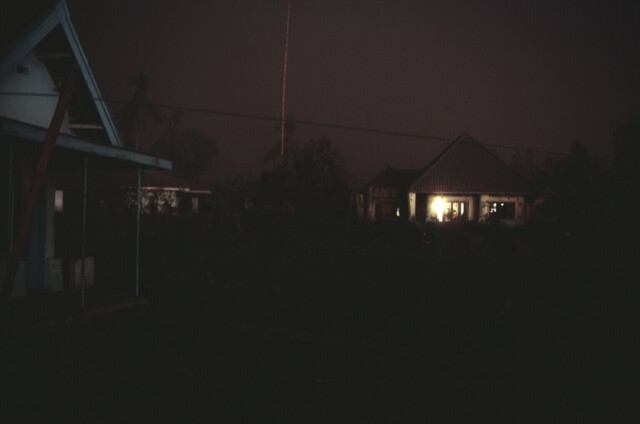 Large glows and frequent lightning were visible from Tasikmalaya. Ash blew to the W and 2 cm was deposited in the vicinity of Garut. Information Contacts: A. Sudradjat and O. Mandraguna, VSI; W. Smith, FAA; M. Krafft, Cernay; Kompas and Sinar Harapan, Jakarta. A phreatic explosion 9 January produced a cloud that was mostly steam with a little ash. Steam emission remained more vigorous than usual for about two days. Local volcanic tremor accompanied the activity but no significant increase in deeper seismicity was noted before or during the increased steam emission. Explosive activity was also reported 31 January but no details were available from the ground and weather clouds prevented satellite observations. 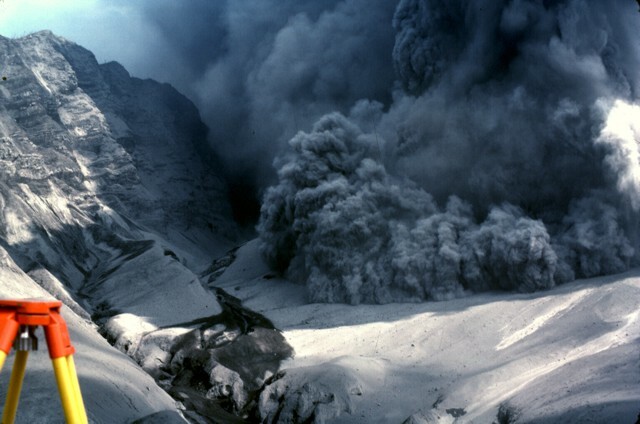 Explosive activity stopped after extrusion of a small lava flow onto the crater floor in early January 1983. Further References. Hanstrum, B.N., and Watson, A.S., 1983, Case study of two eruptions of Mount Galunggung and an investigation of volcanic eruption cloud characteristics using remote sensing techniques: Australian Meteorological Magazine, v. 31, p. 171-177. Sawada, Y., 1987, Study on analysis of volcanic eruption cloud image data obtained by the Geostationary Meteorological Satellite (GMS): Technical Reports of the Meteorological Research Institute (Japan), no. 22, 335 p..
Information Contacts: A. Sudradjat, VSI; W. Smith, FAA. The forested slopes Galunggung in western Java are cut by a large horseshoe-shaped caldera breached to the SE that has served to channel the products of recent eruptions in that direction. The "Ten Thousand Hills of Tasikmalaya" dotting the plain below the volcano are debris-avalanche hummocks from the collapse that formed the breached caldera about 4200 years ago. Although historical eruptions, restricted to the central vent near the caldera headwall, have been infrequent, they have caused much devastation. The first historical eruption in 1822 produced pyroclastic flows and lahars that killed over 4000 people. More recently, a strong explosive eruption during 1982-1983 caused severe economic disruption to populated areas near the volcano. Bronto S, 1989. Volcanic geology of Galunggung, West Java, Indonesia. Unpublished PhD thesis, Univ Canterbury, 490 p.
Gourgaud A, Thouret J-C, Bourdier J-L, 2000. Stratigraphy and textural characteristics of the 1982-1983 tephra of Galunggung volcano (Indonesia): implications for volcanic hazards. J. Volcanol. Geotherm. Res., 104: 169-186. Juwarna H, Wirakusumah A D, Soetoyo, Bronto S, 1986. Geologic map of Galunggung volcano, West Java. Volc Surv Indonesia, 1:50,000 geol map. Katili J A, Sudradjat A, 1984. 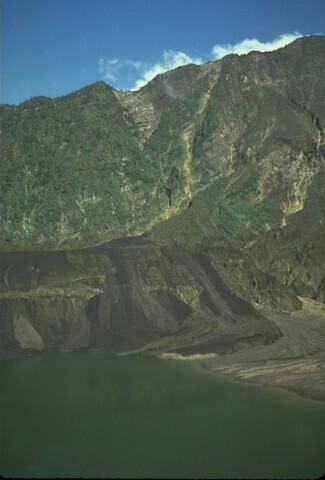 Galunggung: the 1982-1983 eruption. Bandung: Volc Surv Indonesia, 102 p.
There is no Deformation History data available for Galunggung. This August 28, 1986, photo, from the SE rim of Gunung Warirang crater, shows the small tip of the January 1983 cinder cone in the center of the lake just before the cone was completely buried by rising lake waters. Black scoria from the 1982-83 eruption caps the rim of the Gunung Warirang crater; the vegetated wall in the background is the large horseshoe-shaped crater of Galunggung. Three days after a small explosive eruption on July 17, 1918, a lava dome rose above the surface of the lake filling the crater of Galunggung volcano. By the time the eruption ended on July 30 the dome had grown to a height of 85 m and a width of 440-560 m. The lava dome was later destroyed by explosive eruptions in 1982. Photo from Van Es and Taverne (1924) courtesy Tom Casadevall (U.S. Geological Survey). 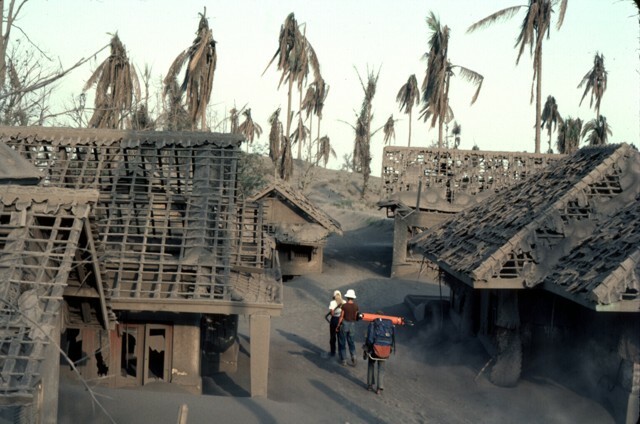 An ash-rich eruption column from Galunggung volcano towers above the city of Tasikmalaya on July 22, 1982. This was one of a series of strong explosive eruptions between May and October that sometimes deposited ash and pumice on the city, located 17 km ESE of the volcano. 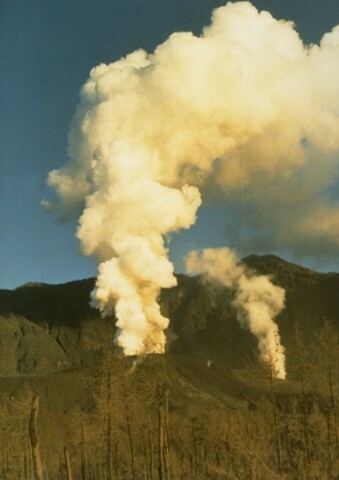 Photo by Bob Koyanagi, 1982 (U.S. Geological Survey). 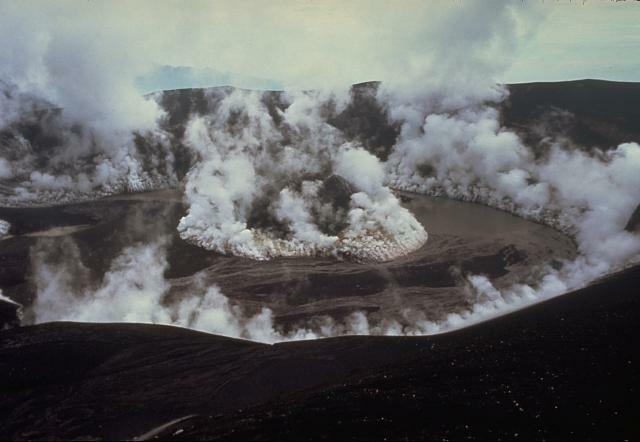 More than three years after the end of the major eruption that began in 1982, the crater is partially filled by a lake. The dark streaks are lahars that swept into the lake as a result of mobilization of tephra deposits from the eruption. Vegetation has again grown on the steep background wall, the SW rim of the massive, 1-km-deep horseshoe-shaped caldera formed by collapse of Galunggung volcano. 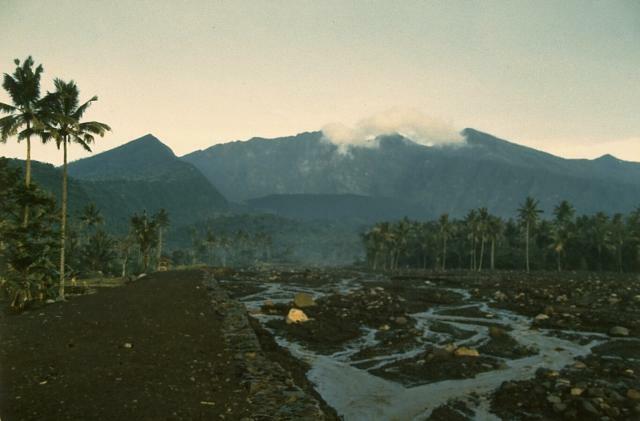 The crater of Galunggung volcano steams on February 5, 1983, a month after the end of the 1982-83 eruption. Vigorous steam clouds issue from a late-stage cinder cone formed in the center of the crater and from the margins of the interior crater wall. A lake that had begun forming in the crater at the time of this photo eventually grew to entirely cover the cinder cone. 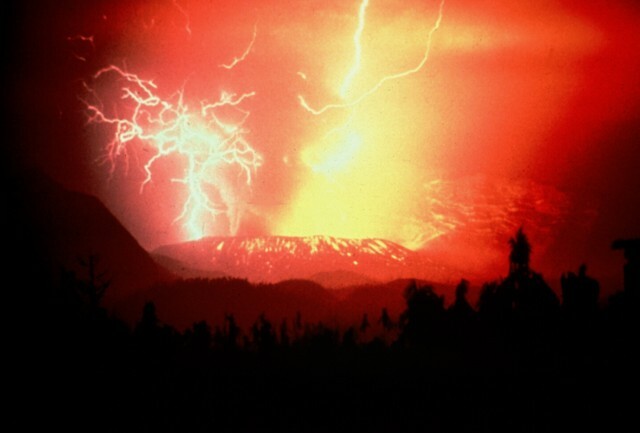 Photo by Don Peterson, 1983 (U.S. Geological Survey). Steam clouds rise above new vents at Galunggung volcano on May 7, 1982, a month after the onset of the eruption. On May 17 more powerful explosive eruptions began, which continued intermittently through much of the year. This photo was taken from Pasir Bentang, about 2 km SE of the crater. Strombolian eruptions from the crater of Galunggung volcano on December 23, 1982 are reflected in a pond at Kubanghurang village, SE of the volcano. The vertical orange lines crossing the house at the left are the traces of an Electronic Distance Measurement (EDM) laser used by Volcanological Survey of Indonesia scientists to monitor deformation of the volcano. A powerful eruption column rises above Galunggung in October 1982. Intermittent explosive eruptions had taken place since the start of the eruption on 5 April, accompanied by pyroclastic flows and lahars that caused much devastation. More than 40,000 people were evacuated during the eruption. The low, forested volcano of Galunggung in western Java is cut by a 2 x 6 km breached crater formed by a massive slope failure that created the "Ten Thousand Hills of Tasikmalaya" at the foot of the volcano. Historical eruptions have been infrequent, but have caused much devastation. This view from within the breached crater shows the low Gunung Jadi cone in front of the crater headwall and lahar channels on the Cikunir River from the 1982-1983 eruption. 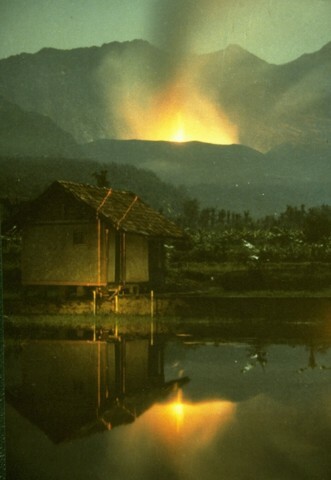 Photo by Ruska Hadian, 1983 (Volcanological Survey of Indonesia). More than a decade after the powerful 1982-83 explosive eruption from Galunggung, the Kawah Welirang crater is filled by a tranquil lake, whose waters cover a late-stage cinder cone emplaced in the crater. A diversionary tunnel was constructed to stabilize the lake level and prevent overtopping and catastrophic breaching of the crater rim. Volcanic mudflows, also known by their Indonesian name, "lahars," are water-saturated mixtures of volcanic debris that sweep down volcanoes and valley floors far beyond. 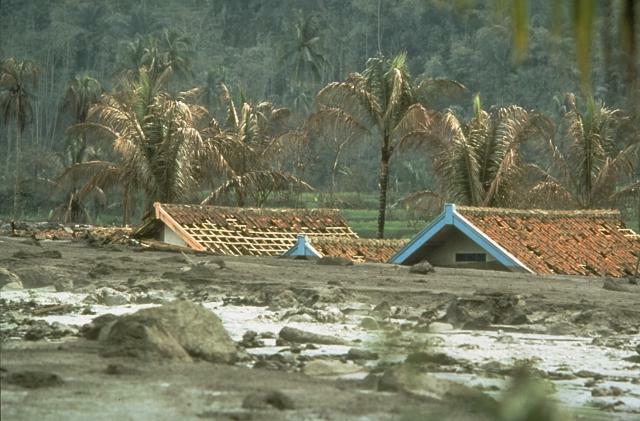 These lahars from the 1982 eruption of Galunggung volcano on the Indonesian island of Java caused extensive damage to houses and croplands. Unlike pyroclastic flows, mudflows are generally low temperature, and these houses were not ignited. Mudflows can remain a hazard long after an eruption ends as heavy rainfall redistributes tephra produced by the eruption. 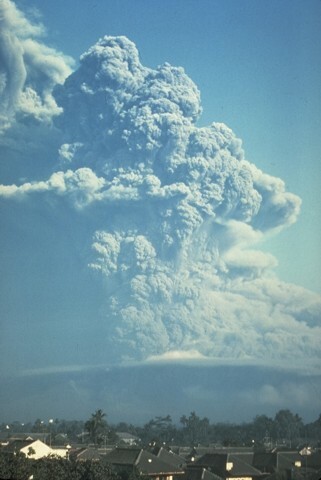 Photo by Robin Holcomb, 1983 (U.S. Geological Survey). 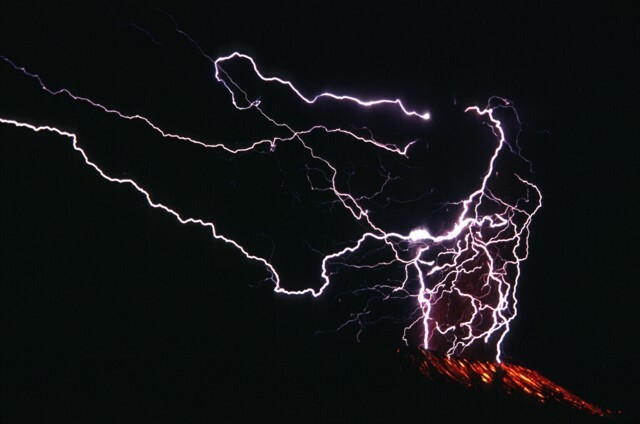 Lightning flashes punctuate a strombolian eruption column from Galunggung volcano on December 3, 1982. Trails of incandescent bombs ejected from the vent form lines on the outer eastern flanks of Kawah Welirang. Late in the 1982-83 eruption strombolian ejections constructed a cinder cone on the floor of the crater. Heavy ashfall from explosive eruptions from Galunggung volcano damaged or destroyed hundreds of houses, including these in a village near Kadong. The eruptions forced evacuation of 62,000 people living in densely populated areas near the volcano. Photo by Jack Lockwood, 1982 (U.S. Geological Survey). Heavy ashfall from explosive eruptions of Galunggung volcano plunged neighboring areas into darkness. This August 9, 1982 photo shows the village of Cikasasah at midday (1315 hrs). The August 9 explosive eruption began at 0935 hrs, accompanied by detonations heard 50 km away, and lasted about three hours. The eruption was minor compared to previous ones, producing a 3-4 km high eruption column and ashfall over a 40 km radius. An explosive eruption from Galunggung on August 7, 1982 is accompanied by a pyroclastic flow whose front can be seen advancing over the crater rim towards a reflector station that was being measured using the tripod at the lower left. The photo was taken from Butik Pasir Bentag, about 2 km from the crater. The steep ash-covered wall of Galunggung's breached caldera forms the 1-km-high cliffs at the left. Jagged lightning bolts sweep across the nighttime sky above the crater of Galunggung volcano on September 16, 1982. This 2.5-minute-long time exposure shows the lightning strikes in the eruption column and reddish incandescent tephra (lower right) marking volcanic bombs ejected onto the outer flanks of the crater. The following 18 samples associated with this volcano can be found in the Smithsonian's NMNH Department of Mineral Sciences collections, and may be availble for research (contact the Rock and Ore Collections Manager). Catalog number links will open a window with more information. Large Eruptions of Galunggung Information about large Quaternary eruptions (VEI >= 4) is cataloged in the Large Magnitude Explosive Volcanic Eruptions (LaMEVE) database of the Volcano Global Risk Identification and Analysis Project (VOGRIPA).